The Philadelphia Phillies won their second consecutive pennant in 2009 and lost to the San Francisco Giants in the 2010 NLCS. Each season, a National League team wins the league's pennant, signifying that they are its champion and they win the right to play in the World Series against the champion of the American League. In addition to the pennant, the team that wins the National League playoffs receives the Warren C. Giles Trophy, named after Warren Giles, who was the league president from 1951 to 1969. Warren's son Bill Giles, the honorary league president and owner of the Philadelphia Phillies, presents the trophy to the National League champion at the conclusion of each National League Championship Series (NLCS). The current National League pennant winners are the Chicago Cubs, who won their 17th NL pennant in October 2016. For most of the history of the National League (94 years), the pennant was presented to the team with the best win–loss record at the end of the season. The first modern World Series was played in 1903, and after a hiatus in 1904, continued until 1994, when a players' strike forced the cancellation of the postseason, and resumed in 1995. In 1969, the league split into two divisions, and the teams with the best records in each division played one another in the NLCS to determine the pennant winner. The format of the NLCS was changed from a best-of-five to a best-of-seven format for the 1985 postseason. In 1995, an additional playoff series was added when Major League Baseball restructured the two divisions in each league into three. As of 2010, the winners of the Eastern, Central, and Western Divisions, as well as one wild card team, play in the National League Division Series, a best-of-five playoff to determine the opponents who will play for the pennant. By pennants, the San Francisco Giants (formerly the New York Giants) (22 National League pennants, 28 playoff appearances) are the winningest team in the National League. The Los Angeles Dodgers (formerly the Brooklyn Dodgers; 21 pennants, 27 playoff appearances). have the second-most. In third place is the St. Louis Cardinals (19 pennants and 27 playoff appearances), followed by the Atlanta Braves (17 pennants and 23 postseason appearances between their three home cities of Atlanta, Milwaukee, and Boston) and the Chicago Cubs (17 pennants and 20 playoff appearances [as the Cubs and White Stockings]). The Philadelphia Phillies won the league in back-to-back seasons in 2008 and 2009, becoming the first National League team to do so since the Braves in 1995 and 1996. Before 1903 there was no World Series as we know it today because the leagues were only loosely affiliated. As of 2014, the San Francisco Giants have the most World Series appearances at 20, followed by the St. Louis Cardinals with 19 and the Los Angeles Dodgers with 18. The team with the best record to win the National League pennant was the 1906 Cubs, who won 116 of 152 games during that season and finished 20 games ahead of the Giants, playing in New York at the time. The best record by a pennant-winner in the Championship Series era is 108–54, which was achieved by the Cincinnati Reds in 1975 and the New York Mets in 1986; both of these teams went on to win the World Series. National League champions have gone on to win the World Series 48 times, most recently in 2016. Pennant-winners have also won the Temple Cup and the Chronicle-Telegraph Cup, two pre-World Series league championships, although second-place teams won three of the four Temple Cup meetings. The largest margin of victory for a pennant-winner, before the league split into two divisions in 1969, is 27 1⁄2 games; the Pittsburgh Pirates led the Brooklyn Superbas (now the Dodgers) by that margin on the final day of the 1902 season. The Pittsburgh Pirates (back row) won the National League pennant in 1903. The New York Giants won their first World Series appearance in 1905 after their owner refused to take part in the 1904 World Series. The 2006 St. Louis Cardinals won the World Series after capturing the National League pennant that same year. In 2008, the Philadelphia Phillies and the Los Angeles Dodgers faced off in the National League championship series for the pennant; the Phillies won, four games to one. a A mid-season labor stoppage split the season into two halves. The winner of the first half played the winner of the second half in each division in the 1981 National League Division Series. The winners played in the 1981 NLCS for the National League pennant. b The leagues were re-aligned in 1994 to three divisions and a wild card was added to the playoffs, but the labor stoppage cancelled the postseason. Wild cards were first used in the 1995 playoffs. The 19th century Baltimore Orioles team won three National League pennants, one of three defunct teams to have won the league. 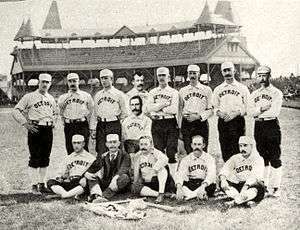 The Detroit Wolverines won their only pennant in 1887, followed by a victory in the World's Championship Series. Italics represent a franchise that is defunct in Major League Baseball as of the 2016 season. j The Brewers were members of the American League through the 1997 season after which they switched to the National League. This table records only the Brewers' National League accomplishments. They won the American League pennant in 1982.
l The 19th-century Baltimore Orioles who played in the National League are no longer in existence; two current American League franchises later used the Orioles name (New York Yankees and Baltimore Orioles). "Playoff and World Series Stats and Results". Baseball-Reference.com. Retrieved January 25, 2010. 1 2 Jensen, Mike (October 16, 2008). "'Fantastic feeling' for Bill Giles". Philadelphia Inquirer. Retrieved August 20, 2009. ↑ Gillette, Gary; Gammons, Peter (2007). The ESPN Baseball Encyclopedia. Palmer, Pete. Sterling. p. 1723. ISBN 1-4027-4771-3. 1 2 3 4 "Playoff and World Series Stats and Results". Baseball-Reference.com. Retrieved January 25, 2010. ↑ Koppett, Leonard; Koppett, Dave (2004). Koppett's concise history of major league baseball. Carroll & Graf. p. 300. ISBN 0-7867-1286-4. ↑ "League Championship Series Results". Baseball Digest. Lakeside. 60 (10): 74. October 2001. ISSN 0005-609X. 1 2 "Pirates agree to move to new division". Ocala Star-Banner. September 16, 1993. Retrieved October 15, 2009. ↑ Formosa, Dan; Hamburger, Paul (2006). Baseball field guide: an in-depth illustrated guide to the complete rules of baseball. Thunder's Mouth Press. pp. 24–25. ISBN 1-56025-700-8. 1 2 3 "San Francisco Giants Team History & Encyclopedia". Baseball-Reference.com. Retrieved March 3, 2016. 1 2 3 "Los Angeles Dodgers Team History & Encyclopedia". Baseball-Reference.com. Retrieved October 8, 2014. 1 2 3 "St. Louis Cardinals Team History & Encyclopedia". Baseball-Reference.com. Retrieved October 8, 2014. 1 2 3 "Atlanta Braves Team History & Encyclopedia". Baseball-Reference.com. Retrieved October 8, 2014. 1 2 3 "Chicago Cubs Team History & Encylcopedia". baseball-reference.com. Retrieved October 24, 2016. ↑ Nightengale, Bob (October 27, 2009). "Phillies hoping for a rare back-to-back Series title". USA Today. Retrieved January 26, 2010. ↑ "1906 Chicago Cubs Batting, Pitching, & Fielding Statistics". Baseball-Reference.com. Retrieved 26 January 2010. ↑ "1906 New York Giants Batting, Pitching, & Fielding Statistics". Baseball-Reference.com. Retrieved 26 January 2010. ↑ "1975 Cincinnati Reds Batting, Pitching, & Fielding Statistics". Baseball-Reference.com. Retrieved 26 January 2010. ↑ "1986 New York Mets Batting, Pitching, & Fielding Statistics". Baseball-Reference.com. Retrieved 26 January 2010. ↑ Knowles, Richard George; Morton, Richard (1896). Baseball. George Routledge and Sons. p. 93. ↑ Good roads: devoted to the construction and maintenance of roads and streets. 31. Burton Publishing Company. 1900. p. 15. ↑ "National League". 40 (1). Lakeside. January 1981: 14. ISSN 0005-609X. ↑ "History of the World Series – 1904". The Sporting News. Retrieved January 2, 2010. ↑ "1876 National League Team Statistics and Standings". Baseball-Reference.com. Retrieved January 25, 2010. ↑ "1877 National League Team Statistics and Standings". Baseball-Reference.com. Retrieved January 25, 2010. ↑ "1878 National League Team Statistics and Standings". Baseball-Reference.com. Retrieved January 25, 2010. ↑ "1879 National League Team Statistics and Standings". Baseball-Reference.com. Retrieved January 25, 2010. ↑ "1880 National League Team Statistics and Standings". Baseball-Reference.com. Retrieved January 25, 2010. ↑ "1881 National League Team Statistics and Standings". Baseball-Reference.com. Retrieved January 25, 2010. ↑ "1882 National League Team Statistics and Standings". Baseball-Reference.com. Retrieved January 25, 2010. ↑ "1883 National League Team Statistics and Standings". Baseball-Reference.com. Retrieved January 25, 2010. ↑ "1884 National League Team Statistics and Standings". Baseball-Reference.com. Retrieved January 25, 2010. ↑ "1885 National League Team Statistics and Standings". Baseball-Reference.com. Retrieved January 25, 2010. ↑ "1886 National League Team Statistics and Standings". Baseball-Reference.com. Retrieved January 25, 2010. ↑ "1887 National League Team Statistics and Standings". Baseball-Reference.com. Retrieved January 25, 2010. ↑ "1888 National League Team Statistics and Standings". Baseball-Reference.com. Retrieved January 25, 2010. ↑ "1889 National League Team Statistics and Standings". Baseball-Reference.com. Retrieved January 25, 2010. ↑ "1890 National League Team Statistics and Standings". Baseball-Reference.com. Retrieved January 25, 2010. ↑ "1891 National League Team Statistics and Standings". Baseball-Reference.com. Retrieved January 25, 2010. ↑ "1892 National League Team Statistics and Standings". Baseball-Reference.com. Retrieved January 25, 2010. ↑ "1893 National League Team Statistics and Standings". Baseball-Reference.com. Retrieved January 25, 2010. ↑ "1894 National League Team Statistics and Standings". Baseball-Reference.com. Retrieved January 25, 2010. ↑ "1895 National League Team Statistics and Standings". Baseball-Reference.com. Retrieved January 25, 2010. ↑ "1896 National League Team Statistics and Standings". Baseball-Reference.com. Retrieved January 25, 2010. ↑ "1897 National League Team Statistics and Standings". Baseball-Reference.com. Retrieved January 25, 2010. ↑ "1898 National League Team Statistics and Standings". Baseball-Reference.com. Retrieved January 25, 2010. ↑ "1899 National League Team Statistics and Standings". Baseball-Reference.com. Retrieved January 25, 2010. ↑ "1900 National League Team Statistics and Standings". Baseball-Reference.com. Retrieved January 25, 2010. ↑ "1901 National League Team Statistics and Standings". Baseball-Reference.com. Retrieved January 25, 2010. ↑ "1902 National League Team Statistics and Standings". Baseball-Reference.com. Retrieved January 25, 2010. ↑ "1903 National League Team Statistics and Standings". Baseball-Reference.com. Retrieved January 25, 2010. ↑ "1904 National League Team Statistics and Standings". Baseball-Reference.com. Retrieved January 25, 2010. ↑ "1905 National League Team Statistics and Standings". Baseball-Reference.com. Retrieved January 25, 2010. ↑ "1906 National League Team Statistics and Standings". Baseball-Reference.com. Retrieved January 25, 2010. ↑ "1907 National League Team Statistics and Standings". Baseball-Reference.com. Retrieved January 25, 2010. ↑ "1908 National League Team Statistics and Standings". Baseball-Reference.com. Retrieved January 25, 2010. ↑ "1909 National League Team Statistics and Standings". Baseball-Reference.com. Retrieved January 25, 2010. ↑ "1910 National League Team Statistics and Standings". Baseball-Reference.com. Retrieved January 25, 2010. ↑ "1911 National League Team Statistics and Standings". Baseball-Reference.com. Retrieved January 25, 2010. ↑ "1912 National League Team Statistics and Standings". Baseball-Reference.com. Retrieved January 25, 2010. ↑ "1913 National League Team Statistics and Standings". Baseball-Reference.com. Retrieved January 25, 2010. ↑ "1914 National League Team Statistics and Standings". Baseball-Reference.com. Retrieved January 25, 2010. ↑ "1915 National League Team Statistics and Standings". Baseball-Reference.com. Retrieved January 25, 2010. ↑ "1916 National League Team Statistics and Standings". Baseball-Reference.com. Retrieved January 25, 2010. ↑ "1917 National League Team Statistics and Standings". Baseball-Reference.com. Retrieved January 25, 2010. ↑ "1918 National League Team Statistics and Standings". Baseball-Reference.com. Retrieved January 25, 2010. ↑ "1919 National League Team Statistics and Standings". Baseball-Reference.com. Retrieved January 25, 2010. ↑ "1920 National League Team Statistics and Standings". Baseball-Reference.com. Retrieved January 25, 2010. ↑ "1921 National League Team Statistics and Standings". Baseball-Reference.com. Retrieved January 25, 2010. ↑ "1922 National League Team Statistics and Standings". Baseball-Reference.com. Retrieved January 25, 2010. ↑ "1923 National League Team Statistics and Standings". Baseball-Reference.com. Retrieved January 25, 2010. ↑ "1924 National League Team Statistics and Standings". Baseball-Reference.com. Retrieved January 25, 2010. ↑ "1925 National League Team Statistics and Standings". Baseball-Reference.com. Retrieved January 25, 2010. ↑ "1926 National League Team Statistics and Standings". Baseball-Reference.com. Retrieved January 25, 2010. ↑ "1927 National League Team Statistics and Standings". Baseball-Reference.com. Retrieved January 25, 2010. ↑ "1928 National League Team Statistics and Standings". Baseball-Reference.com. Retrieved January 25, 2010. ↑ "1929 National League Team Statistics and Standings". Baseball-Reference.com. Retrieved January 25, 2010. ↑ "1930 National League Team Statistics and Standings". Baseball-Reference.com. Retrieved January 25, 2010. ↑ "1931 National League Team Statistics and Standings". Baseball-Reference.com. Retrieved January 25, 2010. ↑ "1932 National League Team Statistics and Standings". Baseball-Reference.com. Retrieved January 25, 2010. ↑ "1933 National League Team Statistics and Standings". Baseball-Reference.com. Retrieved January 25, 2010. ↑ "1934 National League Team Statistics and Standings". Baseball-Reference.com. Retrieved January 25, 2010. ↑ "1935 National League Team Statistics and Standings". Baseball-Reference.com. Retrieved January 25, 2010. ↑ "1936 National League Team Statistics and Standings". Baseball-Reference.com. Retrieved January 25, 2010. ↑ "1937 National League Team Statistics and Standings". Baseball-Reference.com. Retrieved January 25, 2010. ↑ "1938 National League Team Statistics and Standings". Baseball-Reference.com. Retrieved January 25, 2010. ↑ "1939 National League Team Statistics and Standings". Baseball-Reference.com. Retrieved January 25, 2010. ↑ "1940 National League Team Statistics and Standings". Baseball-Reference.com. Retrieved January 25, 2010. ↑ "1941 National League Team Statistics and Standings". Baseball-Reference.com. Retrieved January 25, 2010. ↑ "1942 National League Team Statistics and Standings". Baseball-Reference.com. Retrieved January 25, 2010. ↑ "1943 National League Team Statistics and Standings". Baseball-Reference.com. Retrieved January 25, 2010. ↑ "1944 National League Team Statistics and Standings". Baseball-Reference.com. Retrieved January 25, 2010. ↑ "1945 National League Team Statistics and Standings". Baseball-Reference.com. Retrieved January 25, 2010. ↑ "1946 National League Team Statistics and Standings". Baseball-Reference.com. Retrieved January 25, 2010. ↑ "1947 National League Team Statistics and Standings". Baseball-Reference.com. Retrieved January 25, 2010. ↑ "1948 National League Team Statistics and Standings". Baseball-Reference.com. Retrieved January 25, 2010. ↑ "1949 National League Team Statistics and Standings". Baseball-Reference.com. Retrieved January 25, 2010. ↑ "1950 National League Team Statistics and Standings". Baseball-Reference.com. Retrieved January 25, 2010. ↑ "1951 National League Team Statistics and Standings". Baseball-Reference.com. Retrieved January 25, 2010. ↑ "1952 National League Team Statistics and Standings". Baseball-Reference.com. Retrieved January 25, 2010. ↑ "1953 National League Team Statistics and Standings". Baseball-Reference.com. Retrieved January 25, 2010. ↑ "1954 National League Team Statistics and Standings". Baseball-Reference.com. Retrieved January 25, 2010. ↑ "1955 National League Team Statistics and Standings". Baseball-Reference.com. Retrieved January 25, 2010. ↑ "1956 National League Team Statistics and Standings". Baseball-Reference.com. Retrieved January 25, 2010. ↑ "1957 National League Team Statistics and Standings". Baseball-Reference.com. Retrieved January 25, 2010. ↑ "1958 National League Team Statistics and Standings". Baseball-Reference.com. Retrieved January 25, 2010. ↑ "1959 National League Team Statistics and Standings". Baseball-Reference.com. Retrieved January 25, 2010. ↑ "1960 National League Team Statistics and Standings". Baseball-Reference.com. Retrieved January 25, 2010. ↑ "1961 National League Team Statistics and Standings". Baseball-Reference.com. Retrieved January 25, 2010. ↑ "1962 National League Team Statistics and Standings". Baseball-Reference.com. Retrieved January 25, 2010. ↑ "1963 National League Team Statistics and Standings". Baseball-Reference.com. Retrieved January 25, 2010. ↑ "1964 National League Team Statistics and Standings". Baseball-Reference.com. Retrieved January 25, 2010. ↑ "1965 National League Team Statistics and Standings". Baseball-Reference.com. Retrieved January 25, 2010. ↑ "1966 National League Team Statistics and Standings". Baseball-Reference.com. Retrieved January 25, 2010. ↑ "1967 National League Team Statistics and Standings". Baseball-Reference.com. Retrieved January 25, 2010. ↑ "1968 National League Team Statistics and Standings". Baseball-Reference.com. Retrieved January 25, 2010. ↑ "1969 National League Team Statistics and Standings". Baseball-Reference.com. Retrieved January 25, 2010. ↑ "1970 National League Team Statistics and Standings". Baseball-Reference.com. Retrieved January 25, 2010. ↑ "1971 National League Team Statistics and Standings". Baseball-Reference.com. Retrieved January 25, 2010. ↑ "1972 National League Team Statistics and Standings". Baseball-Reference.com. Retrieved January 25, 2010. ↑ "1973 National League Team Statistics and Standings". Baseball-Reference.com. Retrieved January 25, 2010. ↑ "1974 National League Team Statistics and Standings". Baseball-Reference.com. Retrieved January 25, 2010. ↑ "1975 National League Team Statistics and Standings". Baseball-Reference.com. Retrieved January 25, 2010. ↑ "1976 National League Team Statistics and Standings". Baseball-Reference.com. Retrieved January 25, 2010. ↑ "1977 National League Team Statistics and Standings". Baseball-Reference.com. Retrieved January 25, 2010. ↑ "1978 National League Team Statistics and Standings". Baseball-Reference.com. Retrieved January 25, 2010. ↑ "1979 National League Team Statistics and Standings". Baseball-Reference.com. Retrieved January 25, 2010. ↑ "1980 National League Team Statistics and Standings". Baseball-Reference.com. Retrieved January 25, 2010. 1 2 "1981 National League Team Statistics and Standings". Baseball-Reference.com. Retrieved January 25, 2010. ↑ "1982 National League Team Statistics and Standings". Baseball-Reference.com. Retrieved January 25, 2010. ↑ "1983 National League Team Statistics and Standings". Baseball-Reference.com. Retrieved January 25, 2010. ↑ "1984 National League Team Statistics and Standings". Baseball-Reference.com. Retrieved January 25, 2010. ↑ "1985 National League Team Statistics and Standings". Baseball-Reference.com. Retrieved January 25, 2010. ↑ "1986 National League Team Statistics and Standings". Baseball-Reference.com. Retrieved January 25, 2010. ↑ "1987 National League Team Statistics and Standings". Baseball-Reference.com. Retrieved January 25, 2010. ↑ "1988 National League Team Statistics and Standings". Baseball-Reference.com. Retrieved January 25, 2010. ↑ "1989 National League Team Statistics and Standings". Baseball-Reference.com. Retrieved January 25, 2010. ↑ "1990 National League Team Statistics and Standings". Baseball-Reference.com. Retrieved January 25, 2010. ↑ "1991 National League Team Statistics and Standings". Baseball-Reference.com. Retrieved January 25, 2010. ↑ "1992 National League Team Statistics and Standings". Baseball-Reference.com. Retrieved January 25, 2010. ↑ "1993 National League Team Statistics and Standings". Baseball-Reference.com. Retrieved January 25, 2010. ↑ "1994 National League Team Statistics and Standings". Baseball-Reference.com. Retrieved January 25, 2010. ↑ "1995 National League Team Statistics and Standings". Baseball-Reference.com. Retrieved January 25, 2010. ↑ "1996 National League Team Statistics and Standings". Baseball-Reference.com. Retrieved January 25, 2010. ↑ "1997 National League Team Statistics and Standings". Baseball-Reference.com. Retrieved January 25, 2010. ↑ "1998 National League Team Statistics and Standings". Baseball-Reference.com. Retrieved January 25, 2010. ↑ "1999 National League Team Statistics and Standings". Baseball-Reference.com. Retrieved January 25, 2010. ↑ "2000 National League Team Statistics and Standings". Baseball-Reference.com. Retrieved January 25, 2010. ↑ "2001 National League Team Statistics and Standings". Baseball-Reference.com. Retrieved January 25, 2010. ↑ "2002 National League Team Statistics and Standings". Baseball-Reference.com. Retrieved January 25, 2010. ↑ "2003 National League Team Statistics and Standings". Baseball-Reference.com. Retrieved January 25, 2010. ↑ "2004 National League Team Statistics and Standings". Baseball-Reference.com. Retrieved January 25, 2010. ↑ "2005 National League Team Statistics and Standings". Baseball-Reference.com. Retrieved January 25, 2010. ↑ "2006 National League Team Statistics and Standings". Baseball-Reference.com. Retrieved January 25, 2010. ↑ "2007 National League Team Statistics and Standings". Baseball-Reference.com. Retrieved January 25, 2010. ↑ "2008 National League Team Statistics and Standings". Baseball-Reference.com. Retrieved January 25, 2010. ↑ "2009 National League Team Statistics and Standings". Baseball-Reference.com. Retrieved January 25, 2010. ↑ "2010 National League Team Statistics and Standings". Baseball-Reference.com. Retrieved October 23, 2010. ↑ "2011 National League Team Statistics and Standings". Baseball-Reference.com. Retrieved October 17, 2011. ↑ "2012 National League Team Statistics and Standings". Baseball-Reference.com. Retrieved October 22, 2012. ↑ "2013 National League Team Statistics and Standings". Baseball-Reference.com. Retrieved October 18, 2013. ↑ "2014 National League Team Statistics and Standings". Baseball-Reference.com. Retrieved October 16, 2014. ↑ "2015 National League Team Statistics and Standings". Baseball-Reference.com. Retrieved October 16, 2015. ↑ "2016 National League Team Statistics and Standings". Baseball-Reference.com. Retrieved October 23, 2016. 1 2 "Pittsburgh Pirates Team History & Encyclopedia". Baseball-Reference.com. Retrieved October 8, 2014. 1 2 "Cincinnati Reds Team History & Encyclopedia". Baseball-Reference.com. Retrieved October 8, 2014. 1 2 "Philadelphia Phillies Team History & Encyclopedia". Baseball-Reference.com. Retrieved October 8, 2014. ↑ "New York Mets Team History & Encyclopedia". Baseball-Reference.com. Retrieved January 25, 2010. ↑ "Baltimore Orioles (NL) Team History & Encyclopedia". Baseball-Reference.com. Retrieved January 25, 2010. ↑ "San Diego Padres Team History & Encyclopedia". Baseball-Reference.com. Retrieved January 25, 2010. ↑ "Florida Marlins Team History & Encyclopedia". Baseball-Reference.com. Retrieved January 25, 2010. ↑ "Providence Grays Team History & Encyclopedia". Baseball-Reference.com. Retrieved January 25, 2010. 1 2 "Houston Astros Team History & Encyclopedia". Baseball-Reference.com. Retrieved January 25, 2010. ↑ "Arizona Diamondbacks Team History & Encyclopedia". Baseball-Reference.com. Retrieved January 25, 2010. ↑ "Colorado Rockies Team History & Encyclopedia". Baseball-Reference.com. Retrieved January 25, 2010. ↑ "Detroit Wolverines Team History & Encyclopedia". Baseball-Reference.com. Retrieved January 25, 2010. 1 2 "Washington Nationals Team History & Encyclopedia". Baseball-Reference.com. Retrieved October 8, 2014. ↑ "Milwaukee Brewers Team History & Encyclopedia". Baseball-Reference.com. Retrieved October 8, 2014. ↑ "Brewers switch leagues, join Reds in NL Central". The Kentucky Post. Associated Press. November 6, 1997. Archived from the original on May 5, 2005. ↑ "Complete Baseball Team and Baseball Team Encyclopedias". Baseball-Reference.com. Retrieved 6 February 2010.